Predictions of rain mixed with sun make for another on-again, off-again week in the world of local high school sports. Sectional tournament time quickly approaches as does league title competition. Speaking of sectionals, keep an eye on the Parkersburg South baseball team. The Patriots earned two big sectional wins during a 4-0 showing last week. Todd Burner’s team handed PHS and Ripley mercy-rule defeats of 14-2 and 12-2 respectively. South’s offensive firepower was on display as the Patriots’ racked up double-digit runs in every game with the smallest margin of victory being nine Saturday against Fort Frye. If Class AAA Region IV, Section 1 fans are looking for a favorite to claim the sectional championship South would be a good bet. The Patriots can hit (Ben Menarchek, Nick Yoho, Todd Burner and Drew Cochran are over the .400 BA mark with three more over .350), drive in runs (five players have 8 RBIs or more), and pitch well. Catching South in action this week shouldn’t be hard. Three home games (Monday, Tuesday and Wednesday) means The Hank should be buzzing. 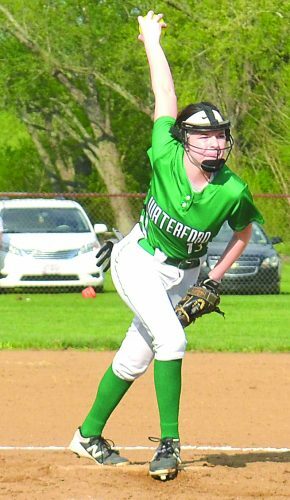 Speaking of buzzing, parents’ and fans’ ears are probably still ringing after the power display by PHS softball last week. Jason Roberts’ team found its groove and sent numerous balls out of the park in almost every contest. Kacee Roberts, our choice for Big School Athlete of the Week, slammed three of her MOV-leading 6 dingers in three consecutive contests. Lexi Summers sits third with four, while catcher Emily Allen has 2 taters good for a tie for fifth. The elder Roberts surely hopes the power output doesn’t drain away. His team has games at Mountain State Athletic Conference-rival George Washington (today), at Parkersburg South (Tuesday) and home against Warren on Wednesday. Down in Class A, the Little Kanawha Conference baseball season finally is heating up now games are being played somewhat consistently. LKC West standings really couldn’t get any closer. Williamstown and Ritchie both sport 4-1 marks (Terry Smith’s Yellowjackets are in first by virtue of a win over the Rebels earlier in the season), while Ravenswood sits at 3-1. Parkersburg Catholic finds itself at 2-2 and St. Marys is 1-2. The Red and Blue Devils meet in a huge matchup at 5 p.m. today (at least on the schedule), with Ed Wilson’s team eyeing another momentum-building upset. St. Marys took down West-leading Williamstown and East-leading Gilmer County last week to put the rest of the division on notice. A win over Wes Swain’s experienced team would be another huge shot of confidence to Wilson’s young group. The East side also gets in on the big-game fun when Gilmer County and Braxton County meeting in Glenville at 5 p.m. Wednesday. Adrian Duelley’s Titans own an 8-0 pod mark, including an earlier win over the Eagles. Another win could possibly wrap up a spot in the LKC title game. “This is definitely one we want,” said Duelley. A Titans’ loss means Braxton has to match Gilmer the rest of the way, pray for another Titans’ defeat in the pod, and hope they can win the tiebreaker at season’s end. Tennis stays just as busy. 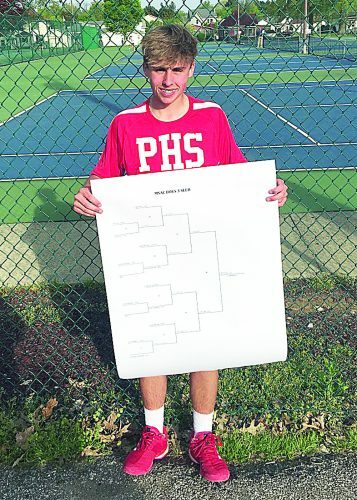 PHS faces the rest of the Mountain State Athletic Conference with the league title on the line Tuesday and Wednesday at Charleston’s Coonskin Park. Big Reds’ boys competitors get the first crack at a coronation when they play Tuesday. A strong performance is needed as George Washington stands as the favorite when play begins at 9 a.m.
Several state tournament finals’ previews could be on tap for the males. Some combination of Parkersburg’s Zarion Jones, George Washington’s Anthony McIntosh and Huntington’s J.J. Mercer will compete for the No. 1 singles’ title in about a month. Then the No. 2 singles’ championship plaque could be GW’s Nadeem Jones and Parkersburg High’s Seena Saadevandi. Jeff Olson and Heidi Asbury’s girls have a great chance to take home the crown Wednesday. The Big Reds’ females are strong 1 through 4 singles and 1 through 3 doubles or the whole roster. Hurricane and Cabell Midland possess great competitors at the No. 1 position, but the rest of either team shouldn’t be able to hang with PHS. A forecast of snow Tuesday would push the boys back to Wednesday as well, but a 63-degree, partly cloudy prediction means good tennis weather regardless (fingers crossed). If travel time doesn’t fit into your schedule but you were dead set on taking in some tennis this week, there are a fewer options close to home. Parkersburg Catholic travels to St. Marys at 4 p.m. today, while Williamstown welcomes Braxton County at noon on Saturday. 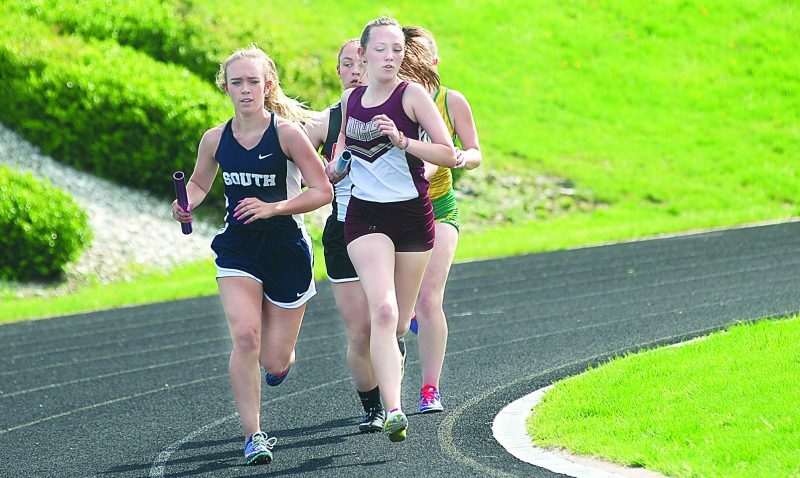 Lastly, Parkersburg South’s girls team welcomes in reigning state champion Huntington for a 4:30 p.m. start Friday at Erickson All-Sports Facility. The Highlanders bring in a lot of new faces after several graduations and defections, but should prove a good test for the Patriots. In the world of track and field, Williamstown hosts the always competitive Fenton Relays at 4 p.m. Tuesday. Doddridge County boys’ performers and Williamstown girls’ performers look for repeat team wins. The Yellowjackets used a strong showing in the field events, while the Bulldogs took advantage of an impressive all-around performance. Speaking of Doddridge County, the Cline Stansberry Invitational is slated to begin events at 4 p.m. Friday afternoon. Hope to see you out in the field!